This early bird experience starts out with a friendly orientation and one-on-one rider training. See all that downtown Austin has to offer on this 90 minute Segway Sightseeing tour of the State Capital of Texas grounds and the Live Music Capitol of the World. Your Segway tour makes its way down Congress Ave with a stop at the only monument (story telling) at Angelia Eberly. From there, your Segway tour-guide will lead you to several picturesque and historic sites in downtown Austin including the charming and haunted Driskill Hotel. After gliding past 6th street’s numerous live music venues, your Segway tour-guide will lead you through the warehouse district (Willie Nelson Blvd), which has grown into a dining and entertainment area downtown, and then to the Moody Theatre, which is home to Austin City Limits with a glimpse of the new library. You’ll see this and much more as you cruise through the capitol of Texas on your Austin Segway tour! Start out with an orientation of the Segway operation, take some practice indoors and outdoors to get your Segway legs. Once you are able to manuver around poles and obstacles, it is time to go experience the city on two wheels. A guide will bring you back in history with information and take you to hot spots for picture taking. Enjoy a 4+ mile ride around downtown Austin. It's easy and anyone can do it. 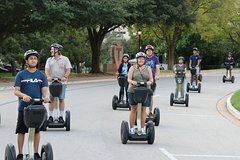 So Segway with the best, we have been giving safe tours in Austin since 2004. The best way to see the State Capitol of Texas grounds, The Driskill Hotel and more.